Vent silencers are used to attenuate noise produced by the expansion of Gas, Steam or Air at elevated temperatures to atmospheric pressure. 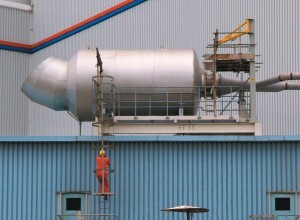 The predominant use of the IMS range of Vent Silencer is within typical applications such as steam ejectors, steam and gas vents, process vents, turbine or compressor bypass systems and safety and relief valves. Each enquiry for steam service should include the mass or volumetric flow rate of the product, the safety valve set pressure and the upstream temperature. Where gas or air is to be considered, the specific gravity of the gas is also required. To aid the selection process, notification of any mandatory noise levels at a specific distance is also essential.